I began “Hunter’s Star” in a workshop taught by Jane Godshall for Tarheel Quilters (May 2, 2015). Click here to read about the beginning of this project. Jane taught us how to use the Deb Tucker ruler for “Hunter’s Star;” this made the project intriguing and fun! The project languished for almost two years. Determined to deliberate no longer, I purchased purple batik at my LQS, Loving Stitches, for border and binding. 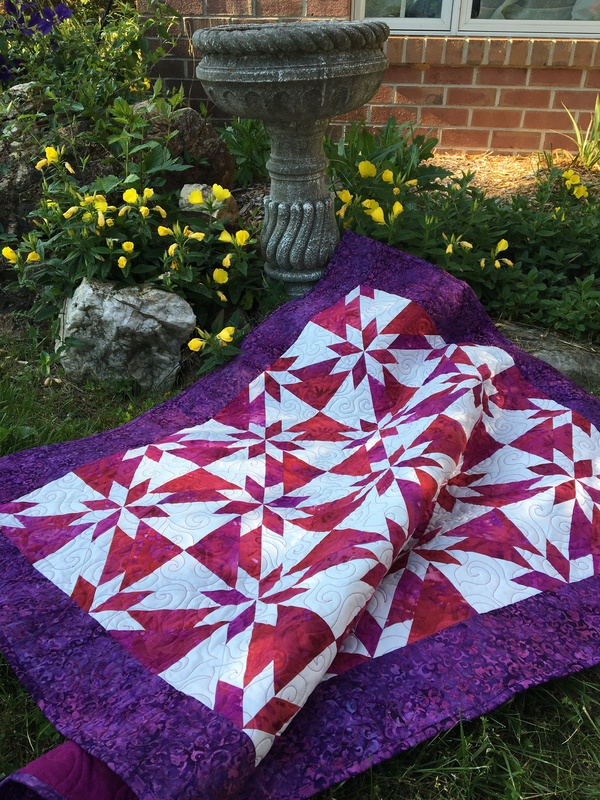 A stylized leaf edge to edge design is quilted in dark red thread which surprisingly blends well with the mottled magenta fabric. Another UFO finished and another check mark for my Summer Projects List! I agree. The star in the middle a bit distracting.love your colors and the final outcome. I’m going to have to check into the ruler you mentioned. This is a pattern I’ve always wanted to tackle but have been waiting to take a workshop on it. No luck there but maybe her ruler can help me. I’ve used one of her other rulers and love it. I have always loved this pattern! Perfect choice of fabric- batiks …..my favorite! !